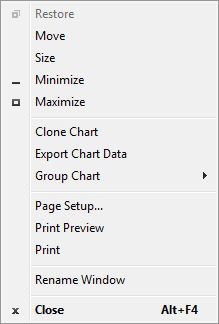 Right-click the top of a chart window to access the titlebar context menu. Restore: Returns a maximized chart back to its previous size. Move: Lets you move the chart window. This can also be done using standard Windows conventions. Size: Lets you move the borders on your chart window. This can also be done using standard Windows conventions. Minimize: Removes the selected chart from view. Maximize: Displays the selected chart on your entire screen. Clone Chart: Creates a replica of your existing chart. Export Chart Data: Creates a .csv file with your current chart data. Group Chart: Puts chart in a Group. Charts in the same Group will center at the same time and show synched vertical and cross hair cursors. Page Setup: Lets you adjust your margins, paper size, orientation and printer for the purpose of printing a chart. Print Preview: Lets you view the pagination of your chart before printing. Print: Sends the selected chart to the printer. Rename Window: Launches the Rename Window dialog box so you can give a vanity name to the chart. Close: Closes the selected chart.